Most Oklahomans have probably never heard of Hallett, Oklahoma. Yet this tiny hamlet of of less than 200 people is well known throughout the motorsports community as the home of Hallett Motor Racing Circuit. Hallett is a 1.8 mile long road course that snakes along the gently rolling hills of Pawnee County. Over the years Brad and I have had the pleasure of racing on, over and around this track in a variety of machinery- everything from dirt bikes to go-karts to street motorcycles to racing cars. It's a fun track and a great facility. 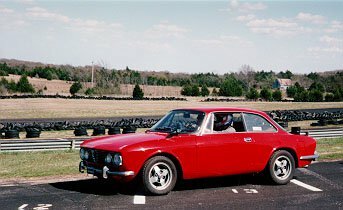 Rex prepares to lap Hallett during an Alfa Romeo track day. That's why I was so pleased to see Hallett listed on a recent blog about great racing courses in America. The article, from Sopwith Motorsports, offers some great history and insight on what it's like to race cars at Hallett. Hallett Motor Racing Circuit hosts car, motorcycle and go-kart races throughout the year in addition to track days for car and bike clubs and the enduro-style Oklahoma Gold Rush. Plus it's not a bad destination for a Sunday afternoon ride. To learn more visit Hallett online at www.hallettracing.net. It is indeed a cool track. My first experience at the track was in the early '70's when the SCCA made a stop there. None other than Paul Newman was entered, driving a Datsun Z car for Bob Sharp Racing. I'll never forget watching his crew change an engine in about 45 minutes between heats. Although he obviously had the sponsorship dollars (two transporters, a spare car, full kitchen, etc.) it was also obvious he was a very talented driver. Over the years I've attended many events there, but that first race is the one that always comes to mind first.